People of music are of two types. Ones who can play pieces of music that they have heard only a few times and ones who can write music of great with seeming ease. The first type relate their music primarily on the basis of their innate talent, while the second time relies heavily on their learned knowledge. Composer keyboard wizard Claude Fernando was such a musician who had both these skills in abundance. He was probably the most outstanding practical musicians of our time. Claude would have never missed his stand for a session of Christmas carols with his company of Broadway singers. In fact King Claude Fernando was planning to expand his group of Broadway singers during this festive period. He also had plans to start Claude singing classes from next year. He was a man of great many ideas who taught music for many students in Sri Lanka. Claude Fernando helped other musicians arrange their music for he was the best man in the field to write music. He was able to write music faster than any other musician in the country that he was able to notate a song while it was being hummed by the other party. He was the keyboardist of Spitfires, who composed,." City of Colombo" which was originally sung by Noeline Honter. He arranged music for all * Suriya* live shows organised in the 70s by late Gerald Wickremesuriya, a principal music promoter at the time.As put it by one of his students, Ranga Dassanayaka , Music producer, Hit Factory, Claude was a great music teacher whose method was so simple and practical. He was able to understand the talent in a student and help his music faster than anyone. Many a great many oriental musicians like R.G. Roksami(violinist) learned theory of Western harmony from Claude Fernando. Claude associated with musicians like Clarence Wijewardena, Melroy Dharmaratna,and Sarath Dassanayaka to name a few, and helped them arrange music and record their composition. 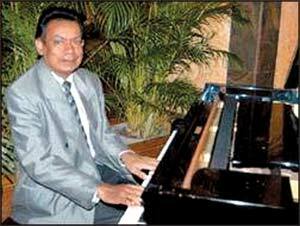 He was the keyboardist for great movies whose music was directed by late Sarath Dassanayaka. His contemporaries remembered him as one of the most humblest of musicians. They all said, he was a simple man, a brilliant musician, a man with a lot of ideas with an amazing ability to put music in play. The reason for this was his genius with the perception of sound with the knowledge of music combined.